DR. 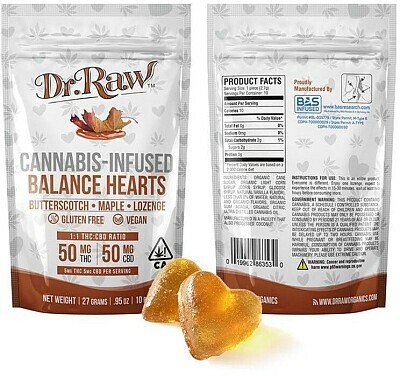 RAW ORGANICS- Balance Formula Hearts 1:1 Lozenges Edibles, Order Weed Online From East Of Eden Cannabis Co.
Gluten Free | Vegan | Organic | Non-GMO | 50mg CBD & 50mg THC| Dr. Raw’s 1:1 THC:CBD Butterscotch flavor Balance Hearts packed with 50% CBD & 50% THC, the perfect balance of these two harmonious medicines. Each single heart contains the perfect dose of 5mg CBD & 5mg THC. These are gluten-free, vegan, organic, & non-GMO! We use seasonal, certified organic fruit & veggie based flavorings & colorings in these all natural hearts. Each Balance Heart package contains 50mg CBD & 50mg THC there are 10 Hearts in a package – 100mg total.